As early as the 1300s, the compass rose became a significant fixture on maps and charts, appearing as a decorative element and used as a vital navigational tool. The first compass rose is said to have appeared on a portolan chart found in the Catalan Atlas, attributed to the Majorcan Jewish cartographer Abraham Cresques and published in 1375. Designed to resemble a flower, the figure’s compass points are compared to the petals of a rose. In its early usage, this figure, also known as a wind rose, was used to indicate the orientation of the cardinal directions of the winds. Absent is an absolute cartographic standard for drafting a compass rose, and as such, over time, compass roses was designed showcasing either 32 points, 16, 8, or 4 points to serve as indicators of the wind. The 4 points compass rose is said to be the first, and more points were designed to gain more precise directional bearings. Common to the compass rose are two important elements, a fleurde-lis or an arrow head signalling North, and the cross of the Order of Christ, which signals East. Before the fleur-de-lis, north was represented by a spearhead, and sometime in the 14th century, the L (for levante) on the east side of the rose was replaced with a cross. The Levante wind refers to the easterly wind that blows in the western Mediterranean Sea. On early 14th century medieval portolan charts, the compass rose is often depicted as a collection of color-coded rhumb lines, with black representing the eight main winds, green, the eight half-winds and red, the sixteen quarter-winds. The compass rose made it easier to follow the directional rhumb lines. It was typical for the average portolan chart to feature sixteen compass roses, and around the end of the 15th century, Portuguese cartographers, for example, began depicting multiple ornate compass roses throughout their portolan chart. The Portuguese’s compass rose was designed with a helmet spike to mark the north point. While it is called the compass rose, some early versions featured drawings of a lily. 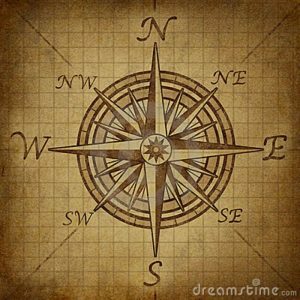 The compass rose offered merchants a way to find their way across vast waters to harbors, where commerce and trade allowed them and the cities they ventured to prosper. Essentially, maps that featured the compass rose were vital tools for seafaring folks, providing situational function and directional guidance. ← Our New Appalachian Trail Feature!